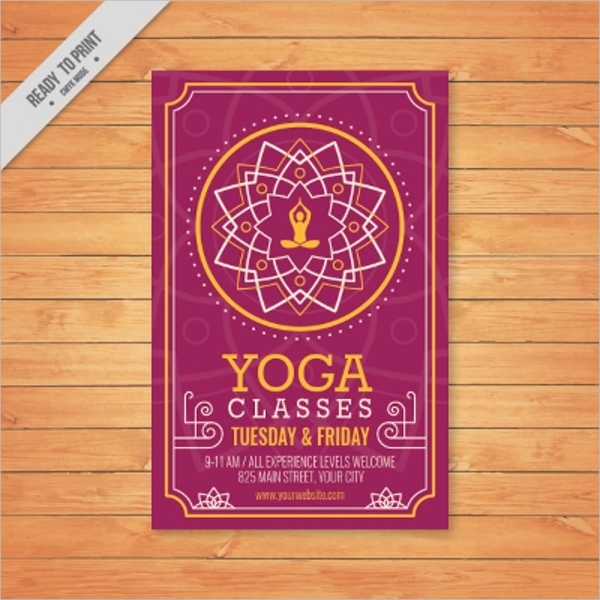 To help you get by in promoting your yoga products or services, we have gathered fifteen best yoga flyer designs. The list features a wide variety of design styles to match with brand and agenda as well as creating visual impact towards your target audience. You may freely download any of our fitness flyer templates for a more extensive selection. Seeing a resurgence in individuals to move forward in a healthy lifestyle has been well-appreciated. Products and services pertaining to aid in a healthy lifestyle also risen and that includes yoga. Though yoga has been a centuries-old practice, the promotion and advertising of such activity have its increase more recently. Yoga in itself is an invigorating activity for the mind, body and overall well-being. If you consider in spreading such experience, advertising is key. Flyers as a visual magnet. Flyers, for both digital and physical uses, serves as an effective traditional media vehicle in promoting events, products etc. as well as for advertising collaterals. 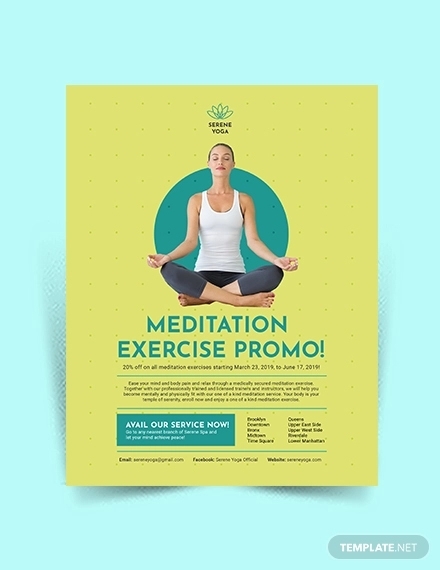 In this case for yoga flyer designs, it is to spread awareness regarding yoga services and events to its designated target audience. With that said, it is best and effective to craft attention-grabbing flyers or better promote the brand’s promise and agenda. How do you want your brand to taken by your target audience and what will set you apart? Those questions can draw concepts for your flyer designs. That is also with the comprehension of your target audience. 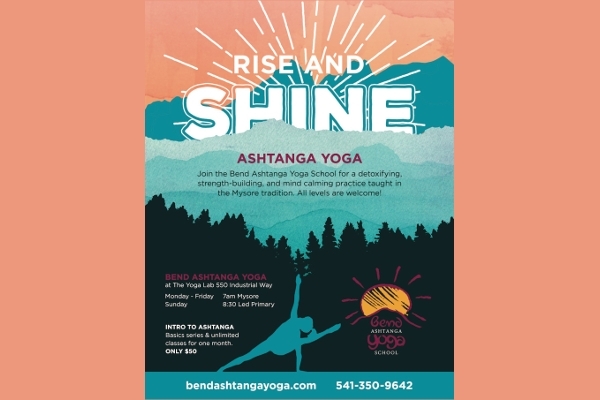 An Assortment of Yoga Flyer Designs. 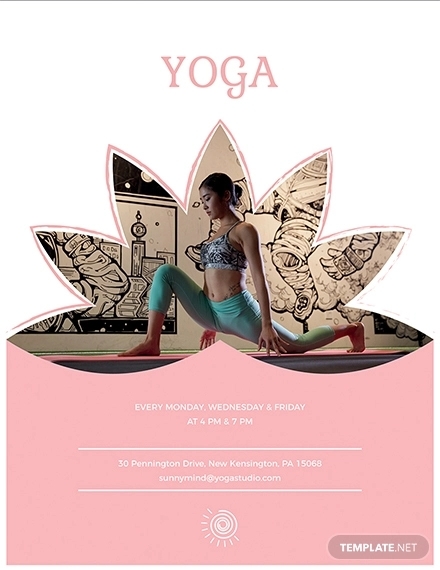 The beauty of this yoga flyer is it centered its art direction by incorporating organic lines to demonstrate gentleness and fluidity. The technical elements followed the formula used for the graphics which is simplicity. The use of typography is the same width as the graphics and applied on rounded edges to create a cohesive design. Lastly, the use of colors are complementary with another; by using warm and cool colors to achieve composition and emphasis on the graphics. It is to note that the colors pink and blue both associates love for oneself and a calming effect. In which best describes the yoga activity. 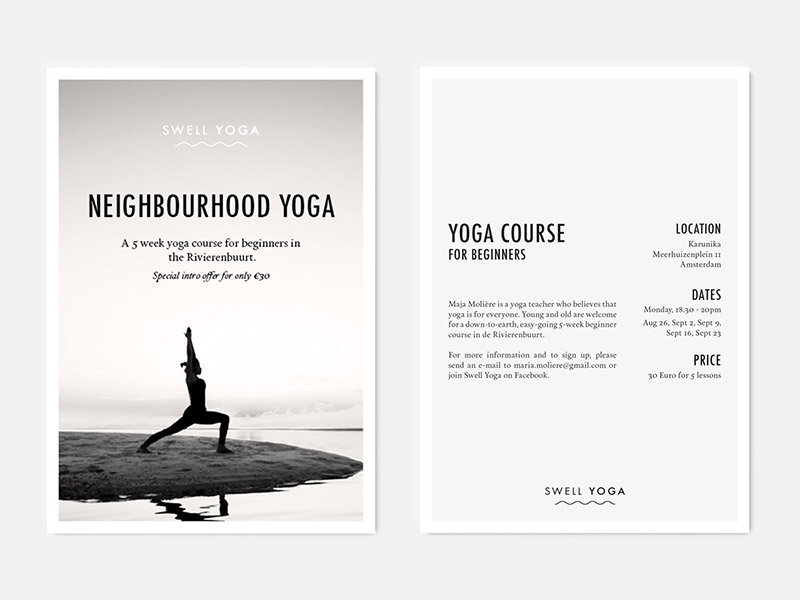 The Simple & Modern Yoga Studio Flyer Design demonstrates a simple take on graphics and layout. All of the design and technical elements are laid out in the middle to create a stable and organized direction in terms of viewing. The use of the purple and violet color amps up the design which stimulates the imagination and spirituality. You may freely use this specific flyer design for physical print be it for small or outdoor advertising. This flyer would be a perfect option for social media content. When you begin meditation, all the senses and attention are drawn to concentrate on bodily reactions and activity. This way you may feel some type of way from meditating and yoga. Such situation is best illustrated in this flyer design. At least you can say that one’s senses are one with the surroundings. The design elements and art direction helped in creating such ambiance and its exterior. The use of cool colors such as blue and green produced a receding visual atmosphere. This specific flyer design also incorporated the use of visual plane with its use of blurred effect and transparent overlay. 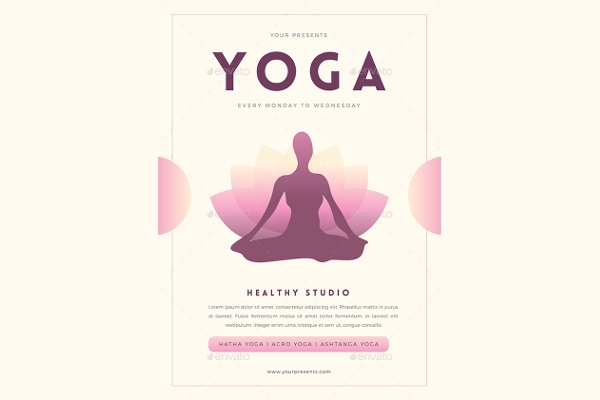 This Yoga Class Flyer Design incorporates the use of complementary colors to bring a cohesive design exterior. The colors as well as used as outlines and shadows in creating silhouettes and dimension. You may freely edit the text and add your text. This flyer design also comes with two more color variations. This flyer design incorporates a light take on mixed media and photo manipulation. The textures and watercolor washes created the background and is combined with vector graphics and typography. The flyer design has been successful in portraying a flat perspective with its visual storytelling. The technical elements are equally distributed and appropriately to build a organized layout without having to look as if its uptight. 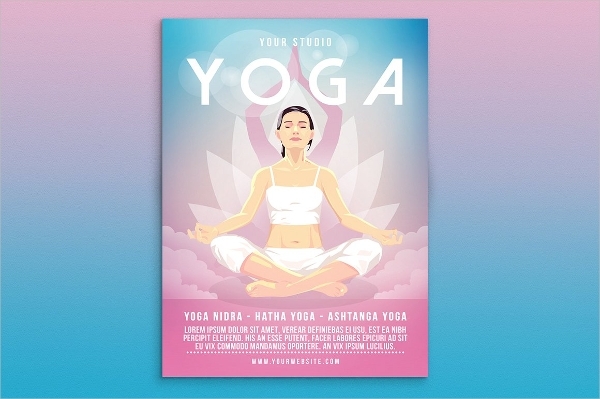 For a fresh take on yoga flyer designs, then look no further. 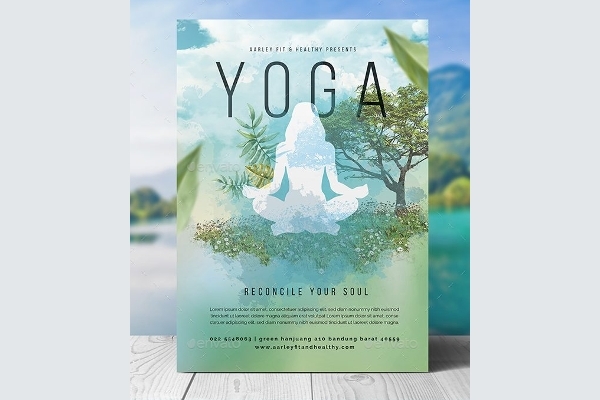 This specific yoga flyer design is set with double exposure technique allowing to combine the image and silhouette to create focal point to the design. The type used for the event might be tricky as it may appear as a different word from afar. 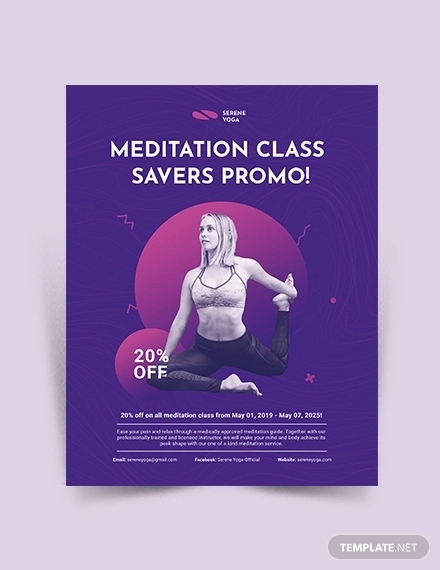 But overall, this yoga flyer design has a creative take with its direction and is perfectly used for events or yoga studio promotion. 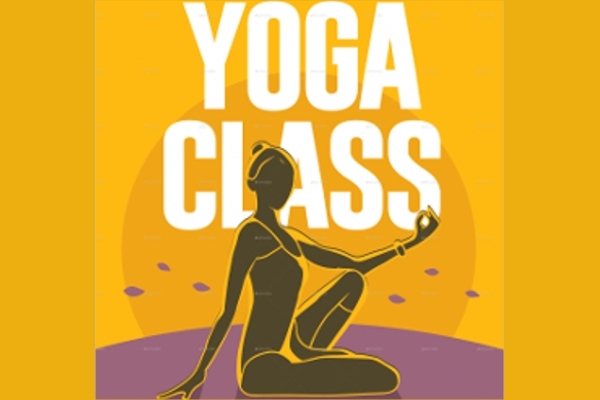 This yoga instruction material demonstrates a lukewarm effect through the use of a monochromatic color scheme and filter. The typographical elements incorporate gradience which is seamless with the background it is set in. 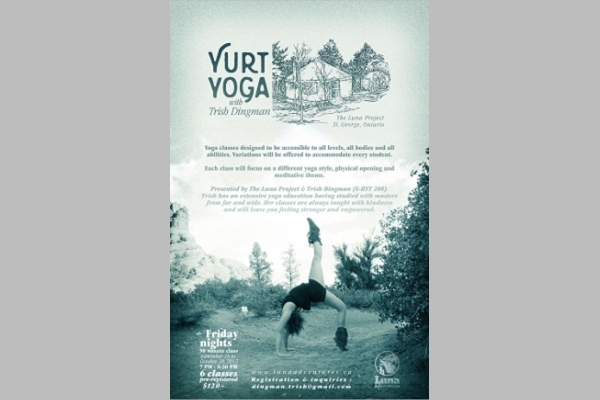 Yoga is best practiced outdoors which is well represented in this flyer design. The natural elements serves as a unintentional border which helps corner other flyer information as well as give the event name and details a focal point. This specific flyer design is dedicated towards a younger demographic and offers two color variations for its flyer design. 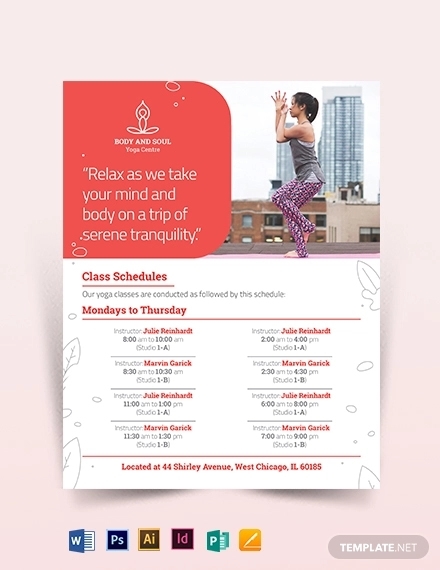 The type of layout used for this flyer design focuses on center alignment allowing the main graphic subject as visual imprint of the overall flyer. 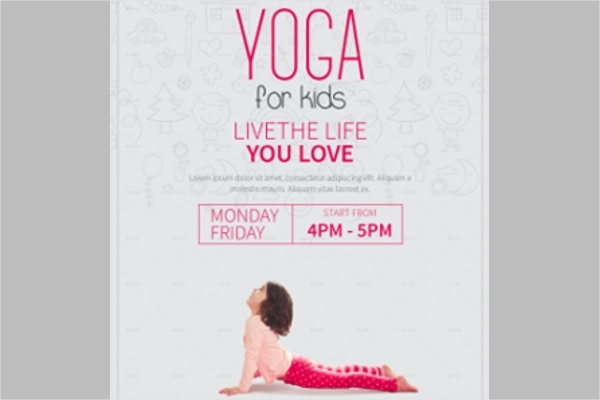 Even though this flyer takes a younger demographic as its subject, this yoga flyer is targeted towards parents and adults. The use of fine and narrow fonts offers readability and emphasis on the text to easily grab attention and for skimming through the flyer’s content. With the use of a picture window as its layout, provides equal use of imagery and space for the text and copy. The image is perfect for text placement as it is not a busy background to disrupt in conveying its message. The text area is set in a simple two-column layout to bring importance on the first paragraph and a faster reading time for the second column. The call of action and information details has been separated and distributed well to bring about a cohesive design. 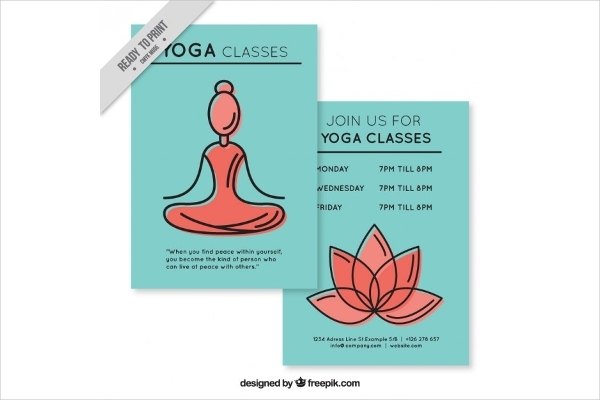 For yoga flyers, it best to be direct and incorporate minimalism with the design and layout to convey the message properly. Which is best represented with this flyer design template, simple and minimal; no fuss. The use of photographic image for this flyer design brings in natural elements and a slice of life to the picture. If you want to go for a relaxing yet modern take on flyer design, then you’re lucky for stumbling on this post. 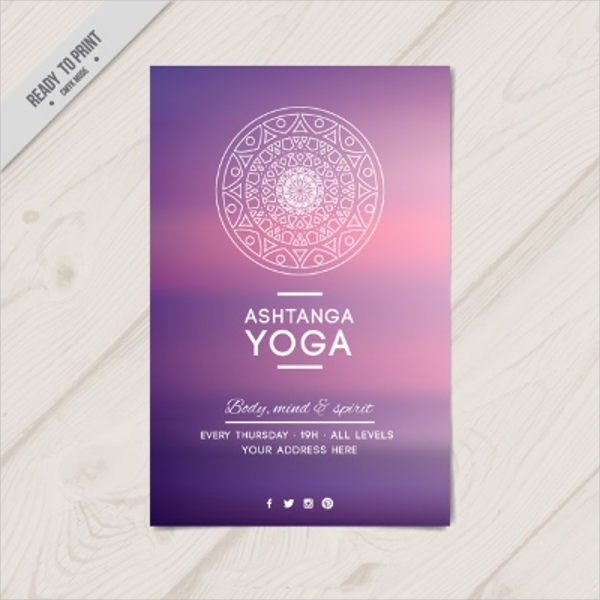 This yoga flyer design incorporates an ombre effect with the use of transparent overlay. It is a general rule when it comes to application of design and in this case, for flyer design, to use three or less fonts. 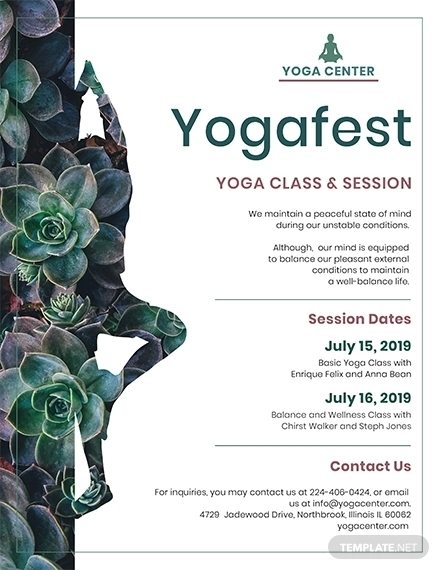 This yoga flyer design followed through and paired its fonts in a way that provides readability both from near and from afar. 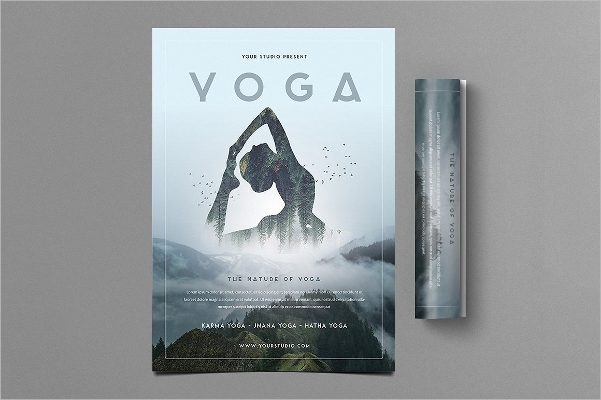 Yoga has always been presented in an authentic design style. 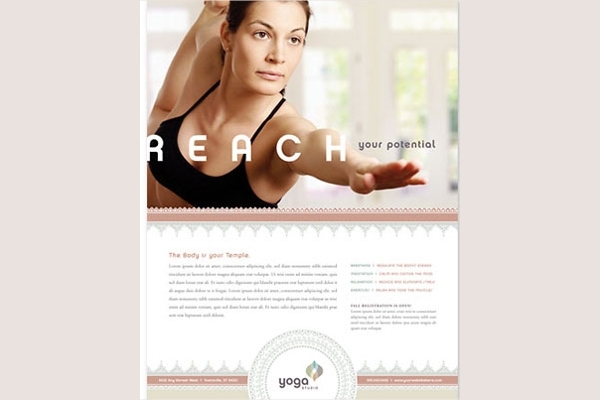 This Geometric and Ornamental Yoga Flyer Design is not at all different given its ornamental aesthetic. But what sets it apart is its dominant use of geometric shapes bringing order. The use of complementary colors helps in leveling the design which gives it depth and layers. The type used also took a memo regarding the overall design following the width and character of the type. The pairing of the colors used for this flyer design brings stability as well as clarity. The use of colors entirely changes the ambiance and emotional connection set in a design. 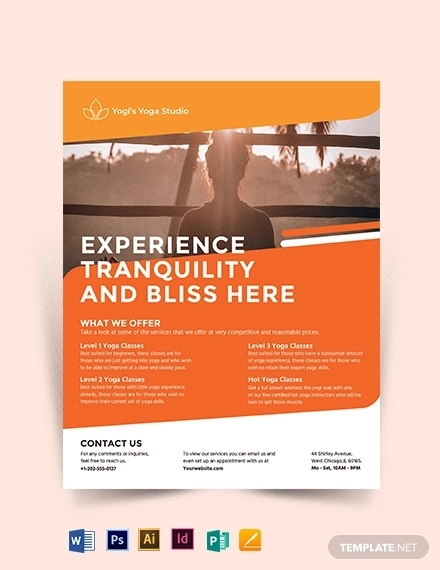 In this case, it completes the overall appearance of the yoga flyer. To follow suit on classic and trending colors, you may skim through Pantone Color of the Year 2016. 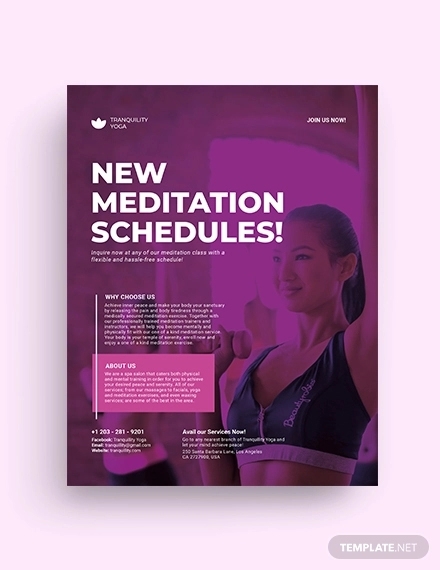 The designated colour is entirely evident in this yoga flyer design. We have more offerings were glad to share with you. 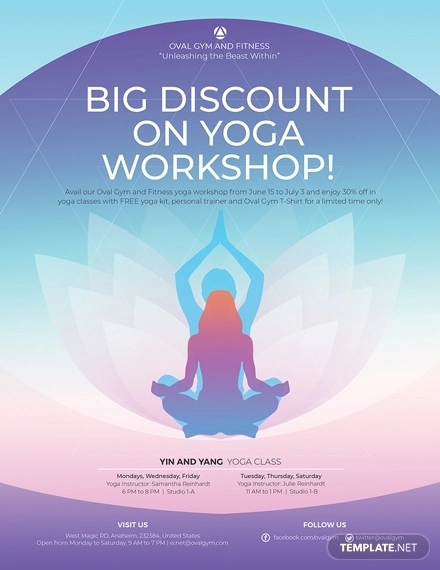 If you are looking for more flyer designs beyond yoga, then you’re in luck. We have listed an extensive collection of flyer designs that will be of great help for your design projects be it graphic design, design presentations, concept process and for future references.